Courage Rises is Melanie Rachel’s first novel and I have to say it was a bold move for a debut book! I’ve got to praise Mrs. Rachel for this novel as it is not at all what I would expect of a first JAFF release. The book is a sequel to Pride and Prejudice but, unlike many others, it does not focus on Darcy and Elizabeth’s relationship. During most of the book our couple is separated and facing their own trials. Mr. Darcy receives a missive from Col. Fitzwilliam asking for his help on a mysterious mission in London, and leaves Pemberley to help his cousin and finish some of his own businesses. A few days later an outbreak of fever arises in the estate and Elizabeth’s strength and leadership skills are tested. If until this moment Mrs. Rachel was doing a great job at exploring Elizabeth’s insecurities regarding her new position, from this moment forward we are assured that Elizabeth is indeed the perfect Mrs. Darcy! She shows everyone why she was Mr. Darcy’s choice! She is intelligent, brave, altruistic, kind, firm and a true patroness to those under her husbands’ protection. These two parallel stories were developed and written with a perfect pace and a good balance that kept me turning the pages without stopping. 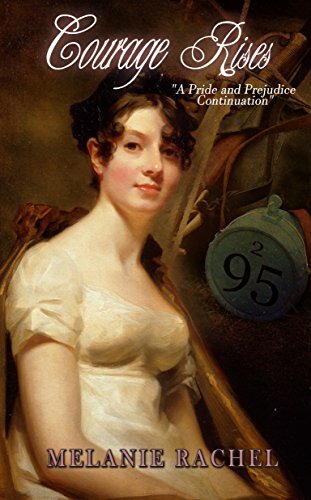 In the beginning of the book I was more interested in what is happening at Pemberley, but as I continued reading (and I read most of it in one day), I became more and more curious about the adventure that Col. Fitzwilliam, Darcy and Bingley found themselves at. New characters will be introduced and one in particular caught my attention: Miss Sophia Hawkes. As I got to know her a little more and started dreaming about her future, the book finished! That’s right, there is a volume 2 coming to the bookstores in the beginning of next year, so be prepared because this story will not end here. We do get closure on Elizabeth’s story, and even some closure on Col. Fitzwilliam’s adventure, but if you are like me, you will want to know more about Sophia’s future. I am therefore quite eager for the release of the continuation, Courage Requires, but until then I recommend this book to those in need of a good read. It does not have the romance we usually see in JAFF, because as I said, Darcy and Elizabeth spend much time apart, but that was not a turn down for me. Elizabeth writes Darcy several letters that tell us the status of their relationship and companionship. We can feel throughout the book they are not the recently married couple still learning each other’s habits, they are already a happily married couple who know one another quite well, and that sense of security was enough for me, so I did not crave for more Elizabeth and Darcy moments. The scene of Darcy’s return to Pemberley after hearing about the crisis is very good, the best Darcy/Elizabeth moment for me in the book, and I hope we get more scenes like that in Courage Requires. Another aspect I appreciated in the book was the vocabulary as it is extensive and I got to learn a few words. This doesn’t happen that frequently despite the fact that I’m not an English native speaker, so I think that Mrs. Rachel did a great job in the writing. Melanie Rachel would like to offer an e-book copy of Courage Rises to one of my readers. The giveaway is international and all you have to do is comment this post and share with us your thoughts on this story. The giveaway is open until the 24th of September and the winner will be announced shortly after that. Great review,Rita!! I can sense by your words that you really liked this story! While I love reading P&P stories,sequels are not my preferred choice. Having said that,it sounds like when D&E finally see each other after such a long time,their reunion is written with care and perhaps with a little hint of romance!! That element of romance is essential in my humble opinion!! Looking forward to reading this book and checking Sophia Hawkes avid whatever she adds to the overall story. Must admit that I’m kinda intrigued by her already!! I love the twist of plot for this variation. I love sequels whether of D&E or the secondary characters so I am looking forward to reading this one. Between your lovely review and others, the anticipation is great! Thank you for the chance at the giveaway! I am more of a variation reader than a sequel reader but I do like the idea of Elizabeth and Darcy writing letters and knowing each other well enough to support each other from a distance . I look forward to checking this one out someday. Great review! The premise sounds intriguing! Love your review Rita. You obviously enjoyed this book. I’m not sure personally as ODC are separated apparently and I prefer them to be together but I would consider reading this and the following book. Thanks for the information. Great review. Added this book to my wishlist. What a great review after reading the one for Courage Required. I am very intrigued with these two books. Thank you for this added chance at the giveaway.